Unique 4BR Soundfront home, nestled in the trees in desirable Southern Shores. 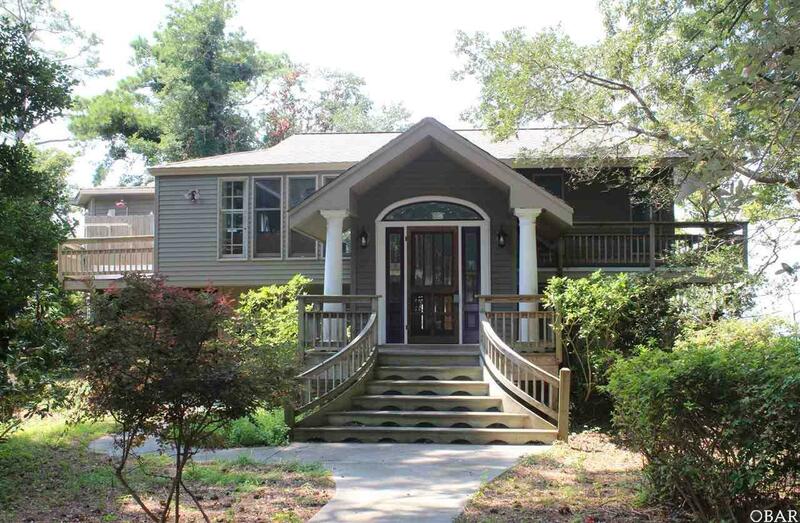 Enjoy the magnificent views from this home from the large soundfront deck with panoramic views of the Currituck Sound. Enter the home through the inviting foyer with beautiful skylights, windows and tons of natural lighting. Upstairs has an open kitchen featuring granite countertops, stainless steel appliances, an abundance of cabinetry and a pantry. The kitchen opens to the dining and living areas with maple flooring, panoramic windows and a gas fireplace, master bedroom has a full bath, walk-in closet and private access to the soundfront deck. 2nd bedroom also has private deck access. Downstairs includes a large game room, a 2nd gas fireplace, two bedrooms, office and laundry room. Enjoy amazing sunsets, fabulous stargazing, and a variety of wildlife, from swans to hummingbirds. You have your own sandy sound beach from which to launch your kayak, canoes or paddleboards! The landscaping includes azaleas, camellias, gardenias, and dogwoods. Highly desirable location in quiet area, yet convenient to the Town ocean access just minutes away at East Dogwood. This is a large, high lot. Flood zones currently shows part of the house in X and part in AE flood zone. The preliminary flood map at NCFRIS (not yet approved) shows the entire house in X. Voluntary membership in Southern Shores Civic Association includes parks, marinas, and more beach access, as well as the boat club ($25/yr) and nearby tennis ($25/yr), if desired. The original small home was gutted, remodeled, and more than doubled in size in 1999, with new wiring and plumbing. Two additional baths were added in 2001. Listing courtesy of Alan Creech of Soles Realty Obx.